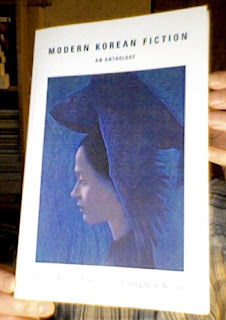 I've been waiting for this anthology of Korean short stories to arrive for some time - and today it came. 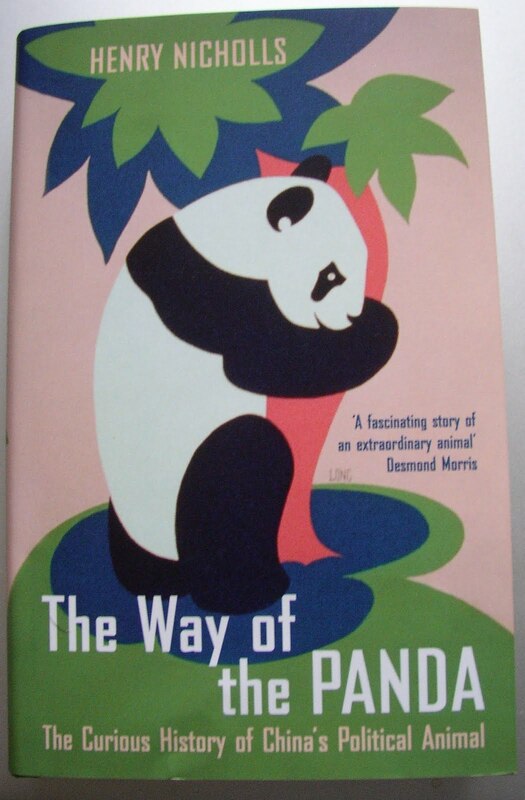 The cover is striking and slightly odd, and flicking through I notice there is a story titled 'The Shaman Painting' and I'm wondering if this might be it. I have to confess that I have only very recently, since my explorations of China, realised that Korea is actually on the northeast coast of China, on the way to Japan - and not, say, as I perhaps would have guessed if asked, somewhere to the southwest, part of that conglomeration of little countries near Thailand. A brief look at the introduction to Modern Korean Fiction tells me that it used to be (part of ) occupied* by Japan fairly recently, and I now know that it is a country divided, like Germany used to be divided, into a Communist northern part with an eccentric government, and a more Capitalist southern part. So I guess there will be the same sorts of tensions, which I expect will be evoked in this collection of work since it spans the whole of the twentieth century. I'm hoping by reading it that I shall get some sense of the Korean psyche - from the writers that live there. "I am writing to you today on behalf of Science Is Vital to ask for your help in supporting an urgent campaign aimed at preventing destructive funding cuts to science and engineering in the UK. The government is scheduled to make public its Comprehensive Spending Review on October 20th where its detailed plans for public spending will be announced. Vince Cable, the Business Secretary and David WIlletts, the Minister for Science have both made it clear that science cannot expect to be immune from cuts but that it is up to scientists to make the case. As yet, final decisions have not been made - though in all likelihood Cable and Willetts are in deep discussions with the Treasury. I hope you can at the very least sign the petition and write to your MP but your support at the planned rally and parliamentary lobby would be fantastic. This is also an opportunity for UK scientists to stand up, not just to be counted, but also to seek recognition for the enormous contribution that science makes to society and the economy in this country. If you think you can add to the argument opposing deep cuts in the UK science budget, please get in touch." Tom Holland, in the very interesting debate on digital publishing at the end of the Society of Authors meeting in Baden Powell House yesterday, described a dystopian view on reading. Anyone brought up in the 'digital age' is so used to reading snapshots without any depth that they never learn to enjoy it. Therefore the demand for novels and extended pieces of non-fiction plummets and they are no longer published. I wonder if such brains would look different, or light up in a different way in an MRI scan. I wonder too if we would lose more than just the ability to read in depth. Maybe our ability to follow logical thought and reasoning would suffer. Maybe it would affect the way we speak; sentences truncated until people spoke in a kind of shortened code - a single word for a well-used phrase. Since there then would be just a limited number of phrases to use I think this would be possible. However, another thought keeps recurring when I hear about the effect of technology on our social and psychological future: all of this is dependent on computers and the associated paraphernalia and our ability to make them, which in turn depends on energy. So what happens after oil peak? Perhaps the resulting lack of energy and petrochemicals will cause a return to basics: the book will again reign supreme, and by this I mean the printed sort rather than an ibook. 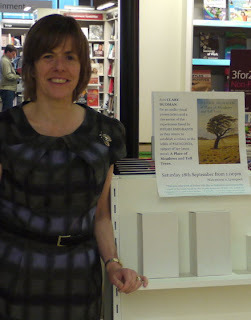 Sue Guiney has asked me some interesting questions about place - which I have answered here, on Sue's blog. 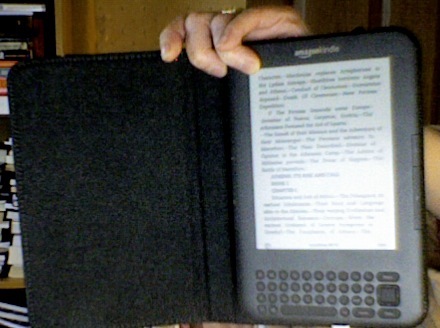 Today I am reading and re-reading three books: one by Honoré Balzac called Cousin Betty - having downloaded his complete works on Kindle; a biography of the magnificently complicated genius Louis Pasteur (by Patrice Debré); and the DK Eyewitness Travel Guide to France. Although I found Balzac's 'A Country Practice' very interesting, I find 'Cousin Betty' far more entertaining - concentrating, as it does, on the social mores of Paris. So far, a retired perfumer has made a proposition to a Countess, whose husband has stolen the perfumer's mistress. The Count is spending all their money keeping his new mistress and their lack of funds is making their daughter less eligible. The perfumer, whose own daughter is married to the countess's son, is proposing that the countess has an affair with him - for which he will pay her enough for her daughter's dowry. The countess has become attractive to him, he baldly explains, not only in her own right, but also as a form of revenge against her husband. Unsurprisingly, the countess is yet to be convinced. 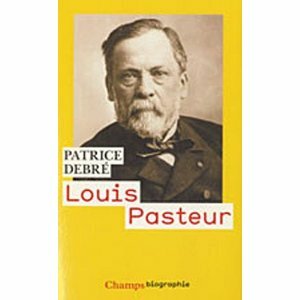 The Pasteur book I am perusing again to remind myself of Pasteur's character (aloof, priggish and uncommunicative). There is also an excellent time-line at the back of the book which is almost essential given that each chapter is thematically rather than strictly chronologically ordered. The 'action' in the Pasteur biography takes place a little later than the Balzac books, but even so I think the Balzac gives a good feel of what French society would be like - and 'The Country Practice' a good indication of how life would be in any isolated French village of the mid nineteenth century - whatever its exact location. Then, there is the travel guide borrowed from the library with lots of pictures and descriptions of the place. 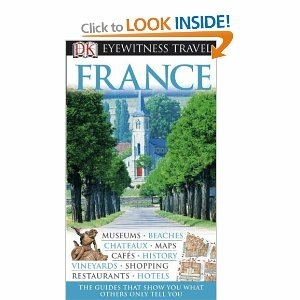 I have been to France many times, but this is good for reminding me what it is like. The area that keeps drawing me is the Languedoc-Roussillon area. The mountains remind me of the area close to Girona I visited in Spain a couple of weeks ago, and their language is similar too. The Langue d'Oc is so called because they speak a form of Catalan there; the word for 'Yes' being 'Oc' rather than 'Oui' as in French or 'Si' as in Spanish. They are all romance languages, derived from Latin, and in Latin there is no single way of saying 'Yes' and so the different languages that have developed from this have chosen different phrases to abbreviate. Welsh is also derived from the Latin, and they have stuck to the Latin root: there is no single way of saying 'Yes' in Welsh either. 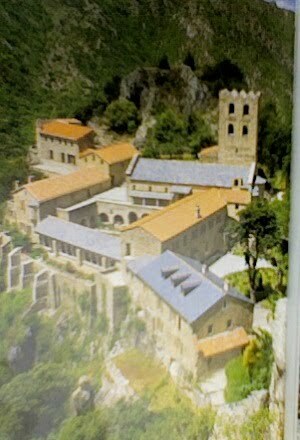 It is of an eleventh century abbey called St Martin du Canigou which can only be approached by jeep or by foot from the village of Casteil. When I was a child I used to have a big poster of this place on my wall, and used to imagine the lives of the people living there, and seeing this picture has reminded me how much I want to got there. I didn't realise at the time, but three weeks ago, in Catalonian Banyoles, I was very close - although only as the crow flies. Balzac's style, as far as I can glean, is a series of intense, funny and well-observed character studies, often told in the form of long conversations between protagonists. For instance, in the novel The Country Doctor, a soldier comes upon the practice of a country doctor. The character of both the countryside and the population are described, then the doctor gives a long reply to the soldier how he made a great change to the fortunes of the neighbourhood, followed, eventually, by an explanation for why he devoted himself to such a cause (which involves a description of his earlier tragic history). The soldier then reveals the real reason for his visit, and the doctor agrees to look after the soldier's adopted son. It is a solution that neatly involves all the main characters in the doctor's life. The most interesting parts of the narrative, then, are in the first person, but it is all couched within the style of an omniscient narrator (this, incidentally is a technique also much-used by the Japanese author Haruki Marukami). Morals are described and examined in a much more overt way than in a modern text, and there is a sense and certainty that evil deeds are punished - if not by a change in fortune, then by some torment of the soul. I would love to get a touch of Balzac in my own work; which is really just a good excuse to read some more. I wake. 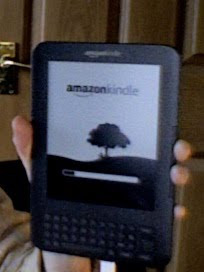 I reach out for my kindle. I switch on. There, in the middle of the text is a faint line. Strange, I think, I've not seen that before. I turn over a page. The line is still there. After just two pages it is slightly irritating. 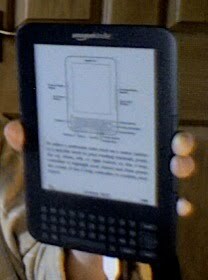 I phone kindle support. There is nothing they can do and a replacement unit will be with me on Monday. Alas, poor Caradoc, your days are numbered. We will, no doubt, soldier on together over the weekend. I shall ignore your line, if you will ignore all of mine. I expect that you will. In Balzac's The Red House a soldier surgeon imagines murdering a wealthy merchant so vividly that when he wakes to find the man decapitated beside him he fears he is responsible - morally if not actually. In Murakami's The Clockwork Bird Chronicle the protagonist enters another world when he sleeps at the bottom of a well. In this world a man, who fits his description exactly, murders the man's brother-in-law with a base-ball bat, and then in some sort of time-lapse, still in this other well-world, he goes on to murder a man in the dark with the same base-ball bat. When he wakes he finds that in the real world the brother-in-law is really in a coma and not expected to recover - though this turns out to be from natural causes. And yesterday I rang to find out why the meeting place for our writing group had been double-booked and discovered that someone had rung to cancel the what may have been our room booking. However, since no one had taken the name of either the group or the caller, they had put a question-mark against our group. And the strange thing is that it had passed through my mind earlier that week that maybe I should soon cancel our room due to lack of interest... so to discover that maybe someone did is weird. Is life reflecting dreams? 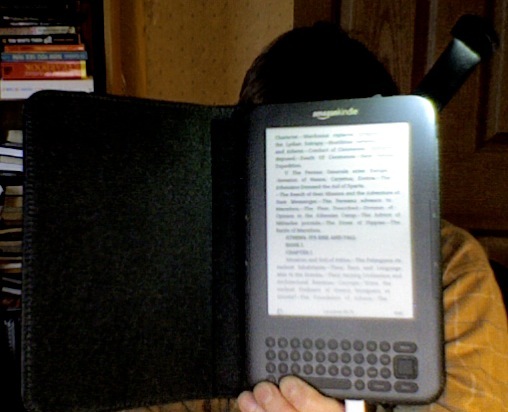 Or am I simply reading too much? I woke early. Some time in the first few hours after waking I made a list. The list seemed to be things I felt I had to complain about: the meeting place double-booked; the train company who charged me excess fare when the fault was theirs; the bookshop who forgot I was coming forcing me to make two journeys and then I had to chase some ideas I'd had and make some phone-calls. I went to the gym and made my muscles ache: a good feeling. I showered again and then made the phone-calls. I put some laundry in the washing machine and sorted some that was dry into piles. Then I sorted the rubbish in the kitchen, removing junk mail from envelopes, checking that none of it was important: paper, waste, paper, cans, glass. An article or two caught my eye; one about Alzheimers and it worried me that I seemed to be failing all the tests. It was lunch-time then so I ate at my desk and flicked open my Kindle and downloaded more Balzac. I read making notes about the way he wrote. the references to French history (which for him would have been recent events) and the slightly archaic vocabulary reflecting another time: 'poesy of their situation', 'phrenological study', 'lined his nose with snuff', a general marvelling at the 'German genius' and their 'capacity for reverie and mysticism', 'inutility', 'coquettishly', and the way 'capitalist' is a term of admiration rather than insult. And it seemed to me that there is so much already to read of such great worth, I wondered why does anyone bother trying to write more. So then, disconsolately, I did the ironing and listened to the last scrap of 'The Clockwork Bird Chronicle' by Murakami and realised why - there is still more to say. And today I heard this: Albioni's second oboe concerto in D minor (opus 9) on the radio and loved it so much I repeated what it was again and again so I would remember it. Now that I have several ways of reading a book: by Kindle, audio or the conventional one of paper, my reading has become a little disjointed. Wisps of ideas from one intrude in another which I find quite interesting. 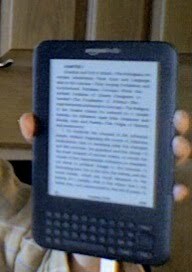 This week I have been (still) listening to Murakami's Wind Up Bird Chronicle (it is a very long book), as well as reading several short stories by Balzac, including Vendetta, Red Inn and Domestic Peace on the Kindle. 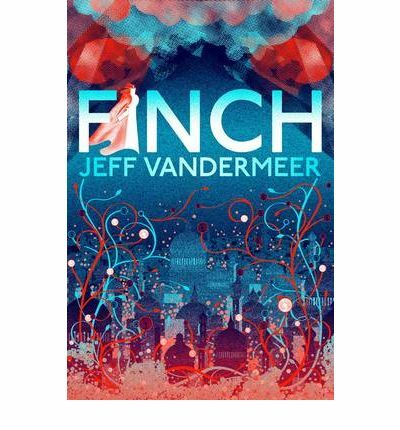 But today I decided to go back to paper and have spent the whole of Sunday finishing Finch by Jeff VanderMeer. This grew more and more absorbing - so much so that I couldn't pull myself away long enough to prepare any meals, and so Hodmandod Senior and Minor had to make do with ready meals instead. Finch is the sort of novel that builds and builds - to a quite magnificent ending. As suggested by the rather wonderful cover it is set in a city which is partly bricks and mortar and partly fungal. The city is called Ambergris, and Finch is the latest installment of a series of books set in this fantastical place: City of Saints and Madmen (which is a huge 496 pages) and Shriek which I loved. City of Saints and Madmen is a collection of short stories (ha, a link with Balzac there perhaps, who also wrote a mammoth collection of stories featuring people of a city); Shriek explored the relationship between a brother and sister in the form of an annotated journal; whereas Finch is written in a rather more clipped style which reminded me of a detective's case book. This is how it starts: two bodies are found as though they have fallen from a great height (even though they are in an enclosed room) and Finch and his colleague are sent to investigate. But Finch is not a detective, as he is at pains to point out; and this novel is about more than a murder investigation. It is about Ambergris. Ambergris, it seems to me, has a plot of its own. The history is forever convulsing, changing and gaining different meanings. Its recent past has been particularly tumultuous. There have been feuds, wars, invasions and something called the Silence. It is a clammy place. Buildings sometimes morph into mushrooms and fungus, and it seems that here decay is an active process. It will overpower and then take over and there is not much anyone can do to stop it. Then there are the people: Graycaps and some mysterious 'others' like Finch's girlfriend, Sintra (and also the hint at the end that Finch may be partly one of these 'others' himself). The descriptions of the characters and the places within Ambergris are vivid, highly imaginative and unusual - and yet convincing too. 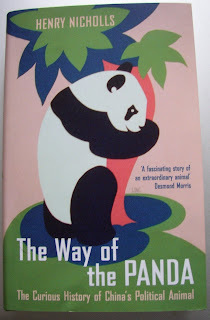 Half way through the book a character from a previous novel makes an appearance and the way he is incorporated into the plot is clever and thought-provoking. It adds yet more layers to the Ambergrisian history. Then there is Finch himself, and his evolving relationship with Wyte, his colleague. Wyte has been infested with fungus and is slowly being transformed into monster. Although still loved for what remains of the man called Wyte he can no longer be fully trusted, and the way Finch deals with this situation makes some of the most emotionally affecting passages in the book. Towards the end of their relationship they blaze through the 'Partials' in an incredibly exciting scene. Then there are more plots, more revelations: not least in 'other' kingdoms, some of the them underground and dark - in some way reminiscent of Jeff VanderMeer's first book Veniss Underground. There is a shamanic quality to both this, and the way the characters are transformed in order to accomplish their various missions. Altogether I found Finch to be an extraordinary book, one in which the city of Ambergris seems just as real as the world outside my window. Today I had a great time in Liverpool One Waterstones and had some really interesting conversations with customers. I learnt about the Patagonian canals, some ghettos in the Isle of Man, another man's explorations in China, and lots of other stories. And I didn't think there would be as much interest in the Welsh in Patagonia story in Liverpool as there was - in fact there seemed to be more interest here than in parts of Wales itself. Here I am at the end of my signing session - together with one of the posters Simon Hicks from Seren made for the event. I've brought a couple back with me as a reminder of this summer. Waterstones Liverpool One is a beautifully designed shop. It occupies a large space on the first floor. The books are arranged in alcoves, and there are spaces for talks. 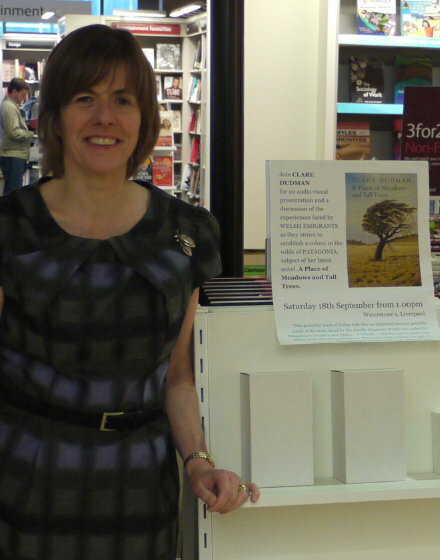 The staff are pretty good too with everything well organised - one of them even bought one of my books. 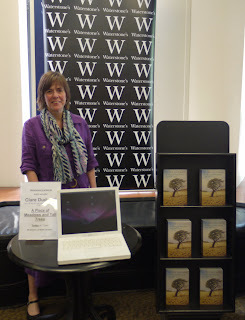 Muchas gracias Waterstones Liverpool One! 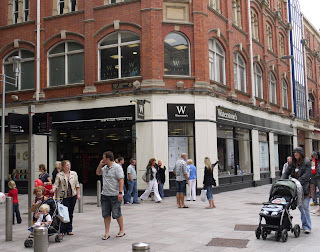 I suppose it is fitting I should end my Welsh Waterstones tour with Cardiff. It is a little humiliating when I think of it, standing there asking people if they'd listen to me tell them about my book, but then I enjoy talking to people and telling them about Patagonia, and sometimes (and this is the best bit of all) they tell me their own stories. In Wales it seems that most people know someone who comes from there or has been out there - and once, in Cardiff, one person I stopped turned out a to be one of the British Council teachers and she'd been over there herself for a year. On balance I have enjoyed this tour. 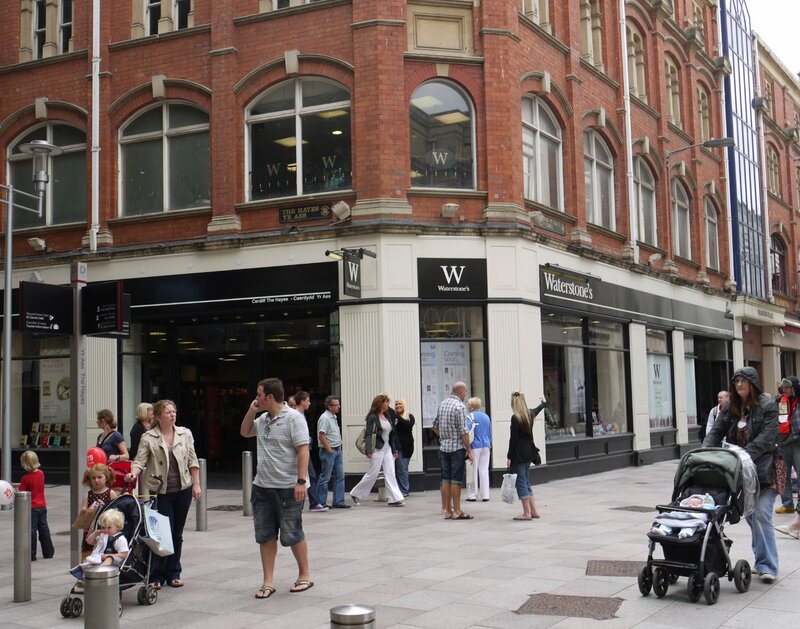 I saw Welsh towns I'd never been to before, taken trains through wonderful countryside, but the best thing has been meeting people - the Waterstones customers and the Waterstones staff - many of whom have been so helpful and enthusiastic. just in case I happen to visit Greece in the next few weeks. 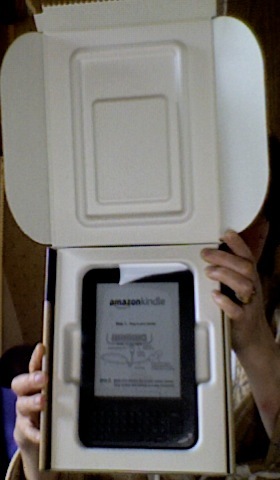 The big moment arrives - my belated and hugely anticipated birthday present - beautifully wrapped from Amazon. My initial impressions - very impressed. The page is remarkably like paper so much so that when Hodmandod Minor saw it he thought it was just a piece of paper attached to the screen and asked me when I was going to switch it on. 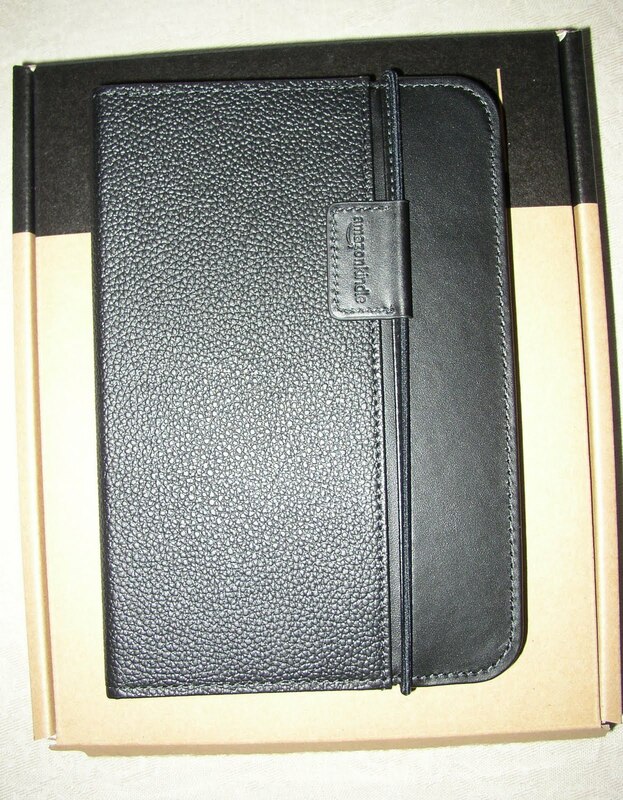 My only slight gripe is with the case. It is attractive, and I am sure it protects it very well, but it does make the thing quite heavy for travel - as heavy as a paperback I would guess. 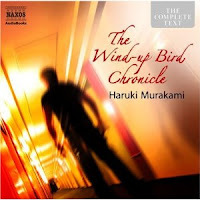 Last night I fell asleep listening to Murakami's Wind-up Bird Chronicle. I keep doing this, which means I end up listening to bits I have only half-heard before, but it's so good it just adds to the effect, so as the characters dream so do I. 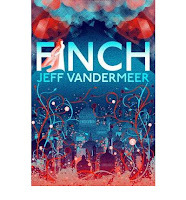 Now I am awake I am reading Finch by Jeff VanderMeer which is just as good as the other Ambergris novels I have read. It's a little like revisiting old friends (well, maybe not 'friends' exactly - I'm not sure I'd want to know a graycap) and I hugely admire VanderMeer manages to evoke such a strange fictional world so convincingly. Every detail is worked out and each time a little more detail sketched in: the huge fungi that grow up and disperse pores, the people infected by spores and yet keep on living, the way buildings are quietly demolished, and now there are memory mushrooms which grow on a corpse and when eaten give the consumer the dreams of the one deceased. This last idea is particularly startling and original - and very useful if you happen to be a reluctant detective called Finch. 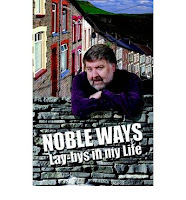 I've been meaning also to say something about Noble Ways by Roy Noble. I loved this autobiography because so much of it seemed familiar to me, and made me remember incidents from my own family history. For instance, I didn't know that he way my grandmother pronounced steak ('steek') was common parlance in that part of southwest Wales. This made me think again about my mother's mortification on being corrected by a supercilious butcher after asking for a pound of the stuff as a young girl. Another section that chimed with me was the idea of looking at people in a restaurant with a certain amount of wonder - because that was never something that my family did either. My ultimate treat as a child was going to Joe's café at the end of a long road from the town, close to the beach in Swansea. It was here that my grandmother used to buy me a nut sundae in a tall glass. This was a simple thing, but impossible to recreate at home - layers of Joe's ice-cream and chopped nuts (coloured a pale green) with raspberry sauce at the bottom and the top. I loved this so much that once, after I had downed the first one very quickly, she asked me if I'd like another. I said yes, and did. This was before calories were invented. 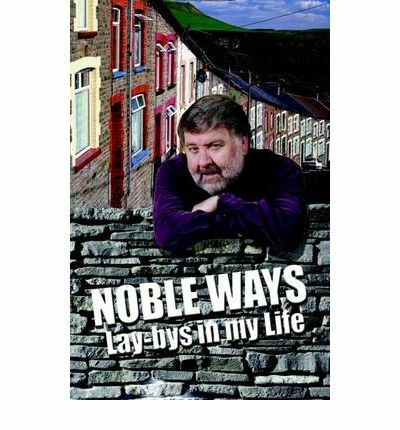 There were very poignant parts in Noble Ways too - the man Roy Noble thought of as his grandfather died in a mining accident, and his funeral was one of the rare times that Roy Noble remembered his grandmother weeping. The next time was when the free coal - which all miners received when employed as a collier - finally ran out. 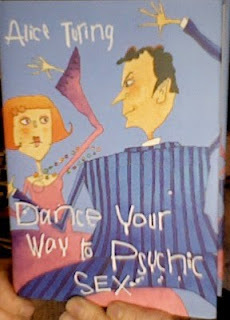 Mainly though, this memoir is very funny; a collection of anecdotes about people which manage to be warm and witty at the same time - the Welsh couple that spoke only in English to each other even though they spoke to their children in Welsh, for instance. This was because they had courted in English, because they considered the Welsh language to be too long-winded. were grapes: purple, small, succulent, lots hanging down, full of pips. apparently allowed to run wild. I sat for a while on a rock in the shade of a tree and thought about nothing very much except that now I am here, I am here, I am here. Sometimes just that seems extraordinary. I had fascinating discussions with a great group of people. Thank you Isobel, Clare, Ros, Sara, Deni, Velta, Tracy, Ricardo, Michael, Lillian, Debbie, Carolina, Marr and, of course, Lee for inviting me again. It was a pleasure to meet (or reacquaint myself with) you again. my book was being discussed. then came down. Go away, they said, we're not finished yet. It was hot, can you tell it was hot? and turned their heads away. I went in a bar and every man in there went quiet and turned to look, and I mimed to indicate I was dying of thirst before remembering the word 'aqua', and left my watch on the counter, and found a pharmacy and mimed again, this time for insect repellent...and got it, 75 mL which didn't work. Then walked back again to baronial mansion with its many rooms, my room being the one behind the small window on the ground floor in the main house on the right. Actually, I was back a day ago but I wanted to do nothing for a bit. I enjoy doing nothing, but then I remember that my days are numbered (although with a large number, I hope) and think I want my life to mean something, and so automatically my thoughts turn to my blog. 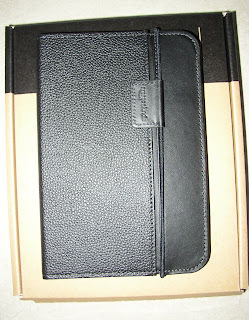 and a Kindle cover - although sadly no Kindle as yet. 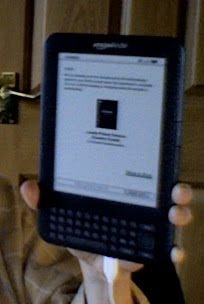 When my Kindle comes I am going to download a massive book on it; not sure which one yet, but I think it will be massive. 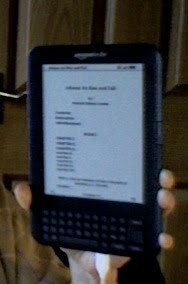 Although of course when it is downloaded on Kindle it will only be as massive as every other ebook. Finally, I want to just mention that the 7 Day Wonder holiday was truly wonderful - but more on that later. 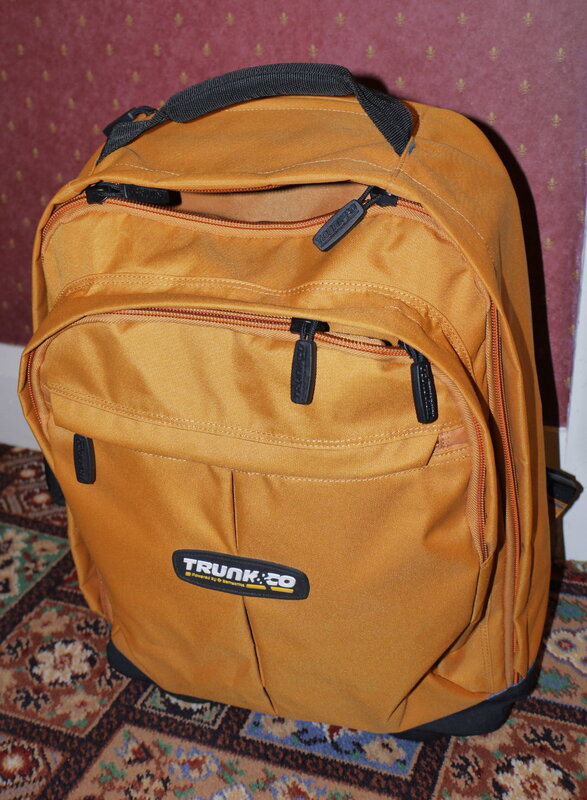 Getting all my luggage into a small rucksack weighing less than 10Kg has made me feel stupidly successful. It is the first time I have ever done this - normally I arrive at a place with an entourage of suitcases, often slightly exceeding the limit, but always let off by the kindness of the check-in staff. Since tomorrow I shall be travelling by Ryanair I doubt I shall be as lucky, so I am being careful with everything. 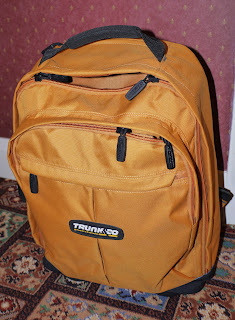 Anyway, despite the restrictions, I have managed to get in not only my camera but also my laptop - hence my triumph. On Friday I am going to make my first ever visit to Spain - so here is a Dutch/English version of Counting Crow's 'Holiday in Spain' which I think rather fine. Today there were two suns in the sky: neither of them distinct or spherical, just a brightness breaking through the wound in a cloud, and then, about 20 degrees to the right, another intense brightness, slightly smaller - the sun's dog.